Using Herbs for seasonings, aromatherapy, therapeutic purposes, and crafts is very common nowadays. This gives us even more of a reason to have a garden right out our back door. One of the flowering plants is Lavender. It is a very popular plant and has beautiful spikes of purple flowers. 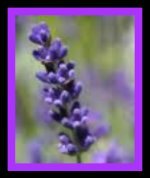 The fragrance or the lavender plant is very clean and fresh. This plant is used in neck pillows, pot holders, for teas, baths, perfume, for headaches and many other applications. The Chamomile plant has beautiful small daisy looking flowers, that have a simple scent like apples. Chamomile is used in teas to help you relax. It is also used in the bath, used for colds, cramps, earaches, headaches, and many other ailments. **The Leaves of the these plants have the most aroma. Rosemary, Marjoram, Fennel, Thyme, and Oregano are very pungent. These are used in cooking, headaches, moth bags, digestion, pot-pourri and many other applications. One of the most common Scents is Lemon. Lemon Balm has a charming bouquet and its flowers attract the bees. It is used for headaches, nausea, sore throat, toothache, tension, etc. 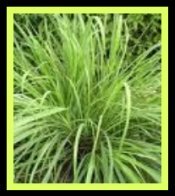 Lemon Grass has a strong scent and is used in cooking and crafts. 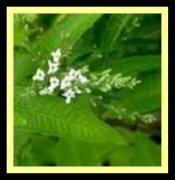 Lemon Verbena is a very sweet smelling tropical plant from South America. The leaves are long, narrow, and very fragrant. It is used in fruit salads, jellies, punch, and ice cream. When used in teas it has a sedative effect. It dries nicely, therefore it's good in pot-pourris, sachets and to put among other linens in your draws and closet. It's also good to scent your bath water and to cleanse your teeth. Lemon Verbena is an all around very good plant. There are numerous plants in the mint family. Basil , the sweet variety, is a very popular plant. It stimulates the mind and body. Basil is best added to tomatoes and eggs, mushrooms, and pasta dishes. The fresh leaves are good in green salads and oil and vinegar dressings. Add to melted butter and use on your favorite fish. It is very good mixed with garlic. When you infuse these leaves, you can drink it as a mild laxative. It is also used for morning sickness. The dried leaves are used as a snuff to clear a nose cold and relieve headaches. Sage is used in stuffings and dressings, in egg dishes, with game, pork, veal, and vegetable (especially onions). It has a very warm scent and taste. Infuse the leaves and drink hot for coughs, colds and constipation. Can be used as a mouthwash and relieves pain. Long ago it was used as a hair rinse and in the bath to make the body smell good. There are many different types of mint and fragrances to go with them Peppermint is the strongest. The leaves are used to flavor fruit salads, summer drinks, sorbets and used for peppermint syrup. An infusion of the leaves is good for indigestion. 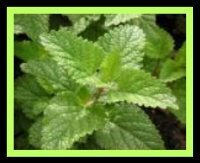 Peppermint oil is used for sprains, bruises, and toothaches. You can rub the fresh leaves on your forehead to ease your headache. Spearmint would be next. The leaves of this plant can be chopped up in vegetable dishes, mint sauces, as a sauce with garlic and yougurt, and with salads. Infuse the leaves and drink hot to aid in digestion. There are also other mints, some of the fragrances are lemon, orange, lime, apple, chocolate, and lavender. These geraniums are not like the normal pink and red geraniums that you find at your local plant center. These plants come from Africa. They have small flowers and the leaves are the aromatic part. They have fragrances that come in rose, lemon, orange, mint, and chocolate. 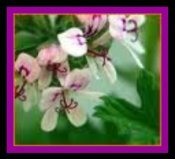 Some herbs in the geranium family even smell like fruits, such as apricots, strawberries, and spices, like cinnamon and nutmeg. They are used in salads, sorbets, and jellies. **These are a few of my favorites. As you see, you can do many things with herbs. I hope you try a few preparations. With the rising cost of fresh products, it is well worth making some of your own. are used in cooking, headaches, moth bags, digestion, pot-pourri and many other applications. My Suncatchers (Sun Dance) are sold in my e-store. The picture does not do it justice. The stain glass, the beads, and the mirrors combine to create a beautiful art piece for you garden. Guaranteed to make your plants happy! W. Atlee Burpee Company had been a leader in gardening since 1876. They provide high quality seeds, plants & supplies for your gardens. They offer a large variety of vegetables, fruits, herbs, flowers, and supplies – all guaranteed to please.